Delahaye Moving offers an all-in-one storage service, that is, Delahaye Moving takes care of its customers’ belongings from the packing till their delivery. 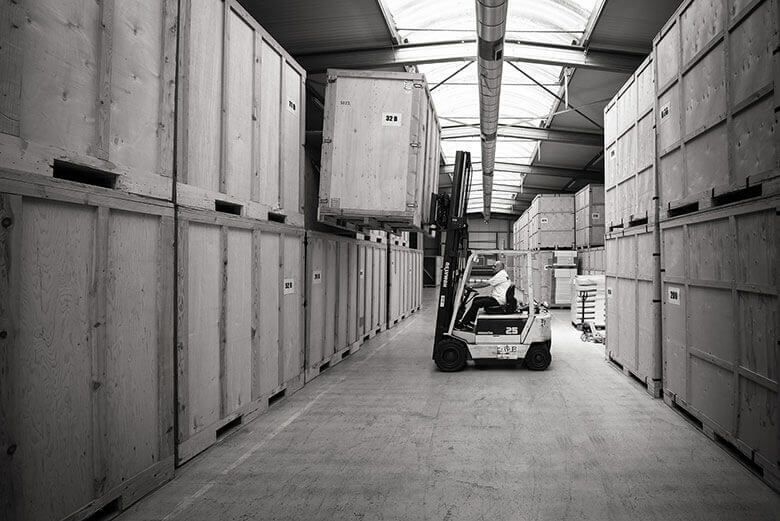 Whether customers need storage for a few weeks only or for a longer period, Delahaye Moving is there to help and offers safe and secure storage. Our secure warehouse is under permanent surveillance, CCTV and fire alarm. Our warehouse is also ventilated, well maintained and clean, a place where we can well receive our customers. Renting a storage container at Delahaye Moving is, for many customers, an advantageous alternative to self-storage. No need to store the content of an entire home; some of our clients have just a few excess boxes at home, some precious ornaments, a piano or several pieces of art they wish to keep safe while the house is rented out or a room they want to empty temporarily. In addition, to facilitate managing the assets stored Delahaye Moving can offer permanent access to a detailed digital inventory with pictures and descriptions. This option is popular with professionals for archiving and to free up office space. At Delahaye Moving each customer has its own storage containers, no question of mixing the goods belonging to several customers. We complete a “bingo” when unloading and loading the truck to make sure we have not forgotten anything. No theft or risk of the wrong delivery. At Delahaye Moving, all handling is done with the utmost care. That’s why our teams of skilled professional movers pack the goods to be stored with bubble wrap as if they were to be exported before depositing them in your storage unit. For peace of mind, we also offer comprehensive insurance. Whether you need short term or long-term storage, for some boxes or for a whole home, contact Delahaye Moving for a free quote.